Meatballs have become very popular again. With the addition of Moroccan sauce adds a new flavour to a classic dish. Preheat the oil in a large frying pan and add the onions and garlic, lightly fry until soft (don't allow to colour), remove and allow to cool. Add the cooked onion and garlic to the chicken mince and egg. Mix together well and form into small balls. Preheat the second quantity of oil in a large pot and lightly deep fry the meat balls until golden in colour. Remove and drain off the excess oil, place into a clean pan. Add the KNORR Moroccan SauceGFto the pan with the meatballs. Cook for a further 10 minutes. Place the almonds onto a large cooking tray and lightly cook in a preheated oven (180 degree Celsius) until golden brown in colour, remove and chop. 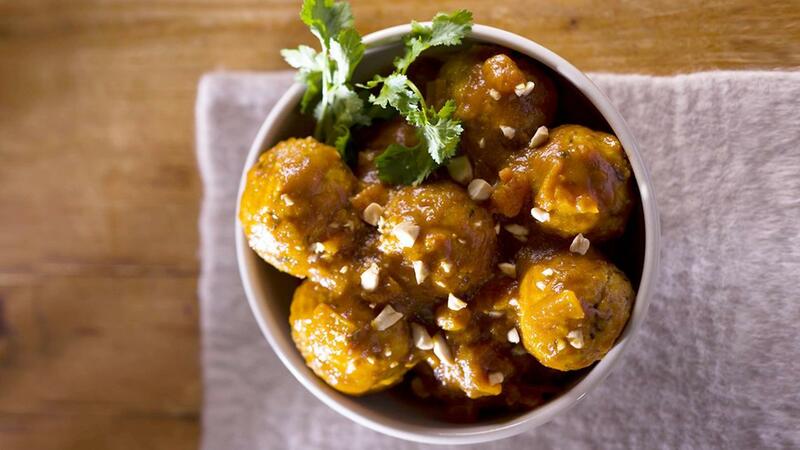 Place the Moroccan meatballs into a bowl and garnish with the roasted almonds and coriander.